"During the performance he ruled the stage, entertained the public and ordered poor Pierrot about until, brought to the point of despair, Pierrot found an imperceptible thread in his tormenter's costume and pulled it. 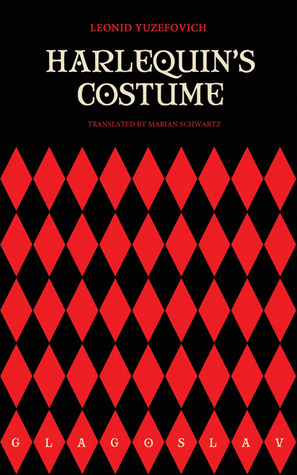 At that, Harlequin's costume, virtuosically sewn from rags with one single thread, fell to pieces." Harlequin's Costume is a blend of two of my favorite genres, crime fiction and historical fiction. The time is 1871, the place St. Petersburg, Russia; Czar Alexander II is sitting on the imperial throne. It is a politically-charged time, and after the death of Austrian military attaché Prince von Ahrensburg, Chief Inspector Ivan Dmitrievich Putilin has a tough job trying to a) determine whether or not his murder is the work of some political faction and b) keep his head above water since the Czar's own secret police are also involved with their own agenda and c) maneuver around circles during a delicate time. The story is told looking back, as Putilin is working on his memoirs, "the most interesting material...accumulated over the course of my career,... something like a chronicle of crime in our Northern capital over the last thirty years." Harlequin's Costume is the first of a three-volume trilogy based on the real Ivan Putilin who served as St. Petersburg's chief of police from 1866 to 1892; in Russia his exploits are the subject of a television mini-series. "Ivan Dmietrievich worked like an artist who scatters smears, blots, spots and lines on the canvas before a bewildered audience, in apparently random fashion, and then, with a flick of the wrist, suddenly pulls them together into a single whole and blinds his viewers with the instantaneous revelation of his intent, concealed hitherto in chaos." and that is precisely the way Yuzefovich writes as well. Ivan Dmietrievich bides his time until he finds that "imperceptible thread" to unravel the investigation; Yuzefovich also waits for the perfect moment to reveal all. My only issue with this novel is that a number of times, with the switch from 1871 to later when Ivan Dmietrievich is discussing his stories with his editor, I did a quick "huh?" at the sudden changes. One moment you're reading about a shipment from Genoa with its cargo of oranges and lemons, and the next the editor is saying "somehow the freight seems out of season." These little sections would be fine (imho) in little chapters by themselves, but within the narrative it was a bit jarring to switch from one time to another so quickly. This is definitely not a book for crime readers who want a quick solution. The story moves a bit slowly, taking you through multiple suspects and their motives, and the author takes his time to set up the political and diplomatic scene while carefully sketching out his characters. This book would probably be suited more for readers of good historical fiction (not the soap-operaish sort) or historical crime readers who want to immerse themselves in a specific time and place while their armchair detective selves try to figure out the whodunit along with the detective. I defy you to figure this one out - I certainly didn't. I hope the publishers don't wait too long before publishing the next installment -- this one was definitely right up my alley. Thanks for the link. I agree with Tony that it got confusing at times as new characters entered, and sometimes the detail is a bit much. It's actually a very interesting book, very different from the usual historical mystery. Hope you're well!